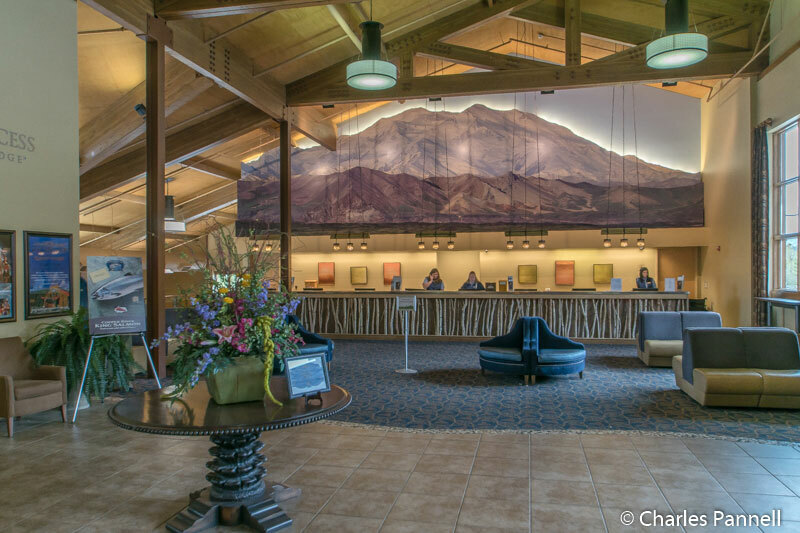 Although there aren’t any hotels inside Denali National Park, there are several accessible lodging choices located nearby. And if you’d like to forego the creature comforts of a traditional lodge and sleep under the stars, you can also pitch your own tent inside the park. To that end, here are some of the top wheelchair-accessible lodging options in and near Denali National Park. Located just a mile north of the park entrance on the George Parks Highway, the Denali Princess Wilderness Lodge (www.princesslodges.com/princess-alaska-lodges/denali-lodge/) is a very convenient and accessible choice. Accessible parking is located near the main lodge, with level access over to the entrance. Inside, there’s barrier-free access to the comfortable seating area around the fireplace, and level access over to the front desk. There’s also elevator access to the downstairs public area, where River Run Espresso is located. This massive property features 656 guest rooms, which are located in separate buildings dotted throughout the wooded complex. That said, nothing is too far away, as an accessible on-property shuttle is available to all guests. The newest accessible rooms are located in the B building. Room 206 features wide doorways and good pathway access; and is furnished with a 28-inch high king-sized bed with wheelchair access on both sides. It also includes a 13-inch high sleeper sofa and a desk with a chair. The large bathroom is outfitted with a roll-in shower with a fold-down shower bench, grab bars and a hand-held showerhead. Other access features include a roll-under sink and toilet grab bars on the left and back walls (as seated). 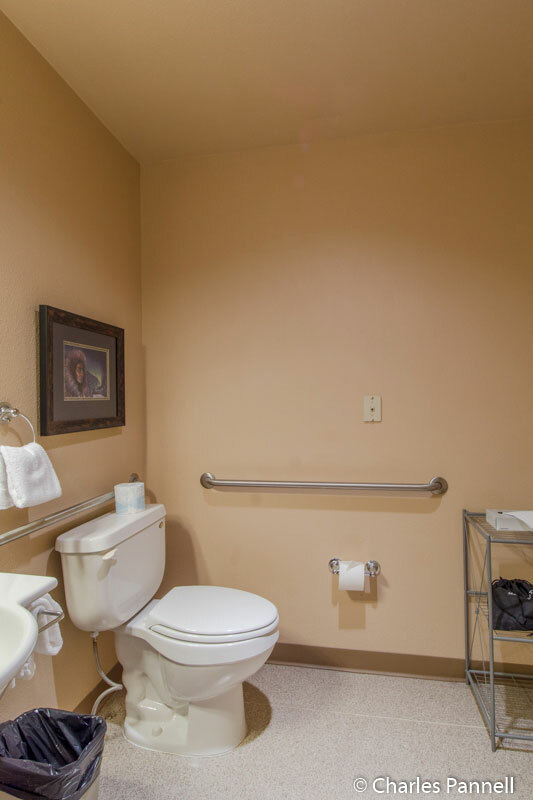 Room 204, which is located next door, includes the same access features, but the toilet grab bars are located on the right and back walls (as seated). 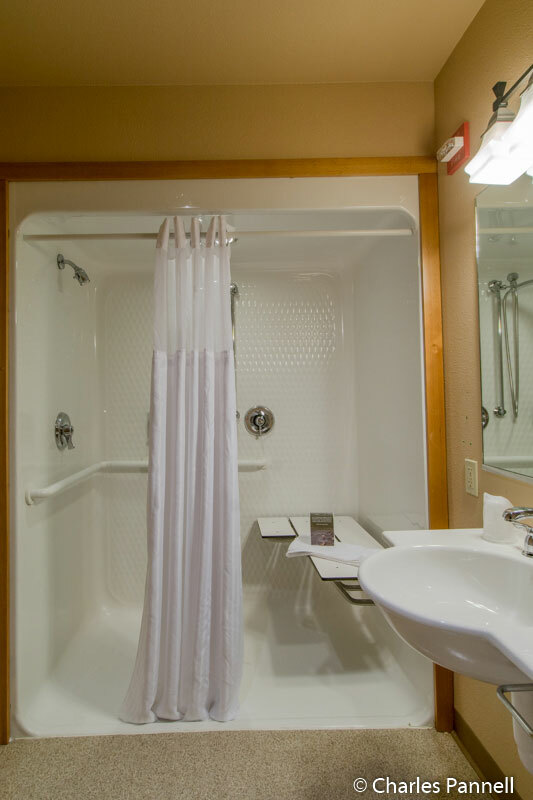 Accessible rooms with tub/shower combinations are also available. These rooms include a shower bench at the end of the tub, a hand-held showerhead, shower and toilet grab bars and a roll-under sink. Shower benches and toilet risers are available for any room upon request. A limited number of medicine refrigerators are also available. Optionally, medicine can be stored in a refrigerator at the front desk. Additionally, the property offers a loaner manual wheelchair for guests who can’t manage distances. The Great Room, which features level access and is located between the A and B buildings, offers coffee and pastries in the morning, and wine and beer in the afternoon. There’s also barrier-free access to the adjacent deck, which is a perfect place to sit back and enjoy the view. There’s barrier-free access to all of the other public areas, including the King Salmon Dining Room, the Grizzly Bar & Grill, and the Lynx Creek Pizza and Pub. Don’t miss the view from the deck off of the Grizzly Bar & Grill either, as it’s known as “the best deck view in Denali”. And when you’re ready to visit the park, a wheelchair-accessible shuttle is available. Denali Park Village (www.denaliparkvillage.com), offers some equally comfortable and accessible accommodations; and since this property boasts a prime location just six miles six miles south of the park, it also makes an excellent home base for a Denali visit. Accessible parking is available near the main lodge, with barrier-free access over to the entrance. Inside, there’s good pathway access to the front desk, the Lucky Miss Saloon, the Gold Rush Dining Room and the gift shop. This 338-room property features spacious accessible rooms housed in buildings throughout the wooded campus. And although some of the offerings are a good hike from the main lodge, an accessible on-site shuttle bus is also available. 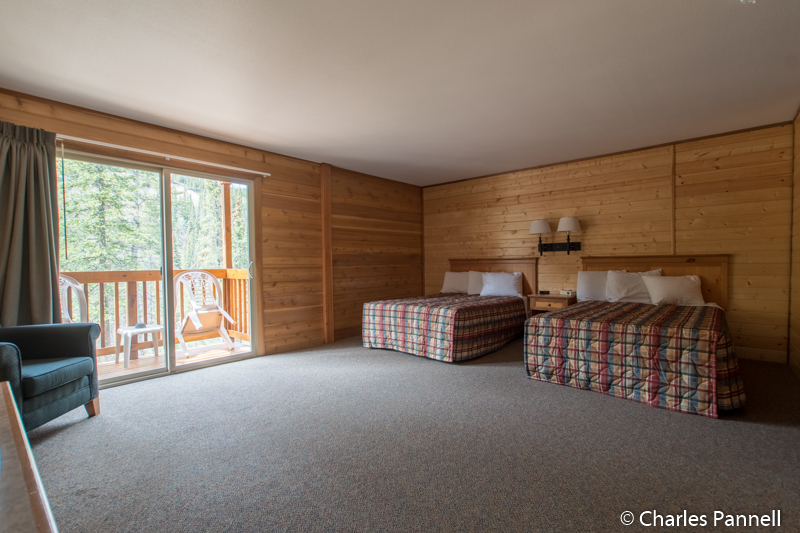 The 700 building, which is located near the main lodge, offers a number of wheelchair-accessible rooms. It should be noted that this is the only building with elevator access, so if you need a ground floor room, it’s important to make that need known when you make your reservation. Room 706 features wide doorways and good pathway access. It’s furnished with a 25-inch high queen-sized bed with wheelchair access on both sides. Additionally there’s a small roll-under sink in the main guest room area. The room also has a small deck area that overlooks the river, and although there is a one-inch lip out to it, it’s doable for most people. There’s also a table with two chairs on the deck, but they can be easily moved to accommodate a wheelchair. 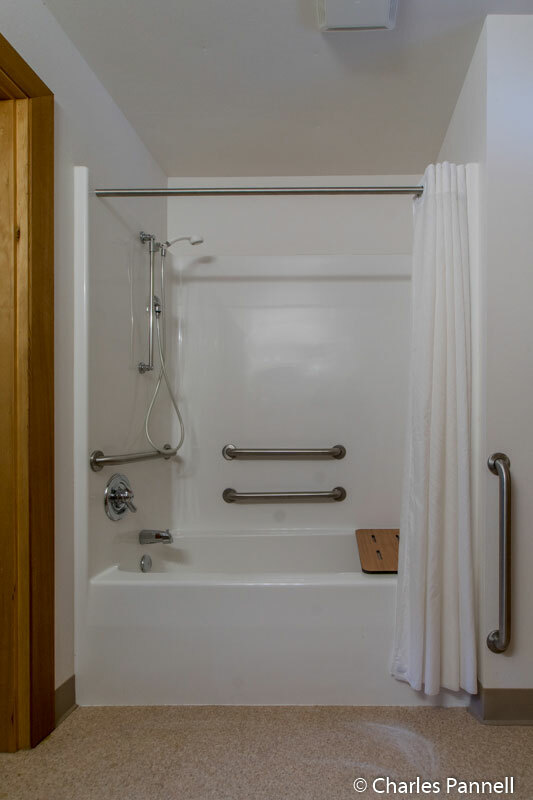 The bathroom features a full five-foot turning radius and is outfitted with a roll-in shower with a fold-down shower bench, grab bars and a hand-held showerhead. There’s also a larger roll-under sink in the bathroom, and the toilet grab bars are located on the left and back walls (as seated). And if you need toilet grab bars on the other side (right and back walls as seated), room 712 is a mirror image of room 706. Miners Plaza, which is located at the other end of property, offers a variety of small businesses connected by paved level pathways. There’s barrier-free access to all buildings, including Quigley’s General Store, where you can get ice cream; The Shack, which serves up some mean burgers; and the outdoor stage, where a variety of interpretive programs are presented. Miners Plaza is also home to Cabin Nite Dinner Theater — a must-do while in the area. There are steps up to the front entrance of this authentic roadhouse, but barrier-free access on the side. Inside, there’s plenty of room to navigate a wheelchair or scooter around the long picnic tables; and if you can’t transfer to a bench seat you can just roll up to the end of a table. And the friendly staff is very accommodating, as far as seating and dietary restrictions are concerned. Again, advance notice is essential in getting the accommodations you need. The hearty meal is served family style and begins with salad and biscuits, followed by pork ribs, salmon, beans, corn, and mashed potatoes. And it’s topped off with some luscious mixed berry cobbler served with fresh whipped cream. The food is excellent and it’s served at the perfect temperature — something that’s not easy to accomplish at a group dining experience. After dinner, guests are treated to a show that’s filled with singing and dancing, lots of Alaska characters and a good dose of audience participation. The servers are also the entertainers, and although a show like this could get a big yawn, this one manages not only entertain but also involve the audience. It makes for a great evening — one that you can enjoy even if you aren’t a lodge guest. 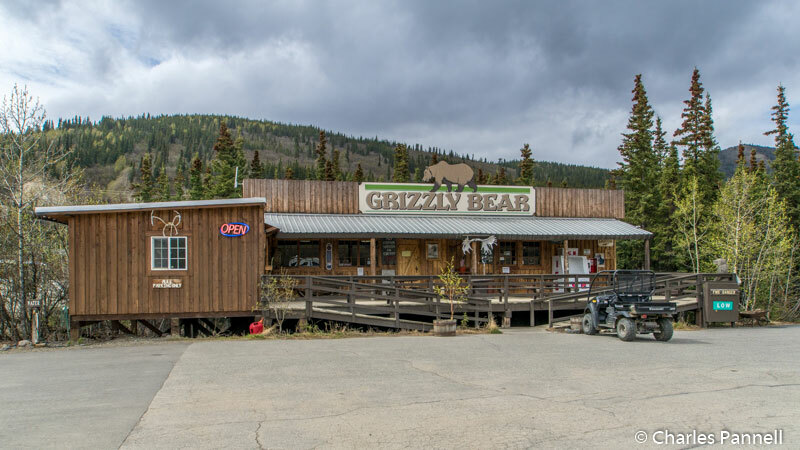 If you’d prefer a smaller family-owned property, then the Denali Grizzly Bear Resort (www.denaligrizzlybear.com) is just the ticket for you. And since it’s across the street from Denali Park Village, it’s also close to the restaurants and concessions available there. The one caveat to this property is that you need your own transportation, because there’s no accessible shuttle there. That said, there’s something to be said for exploring the 49th state in your own rental vehicle. 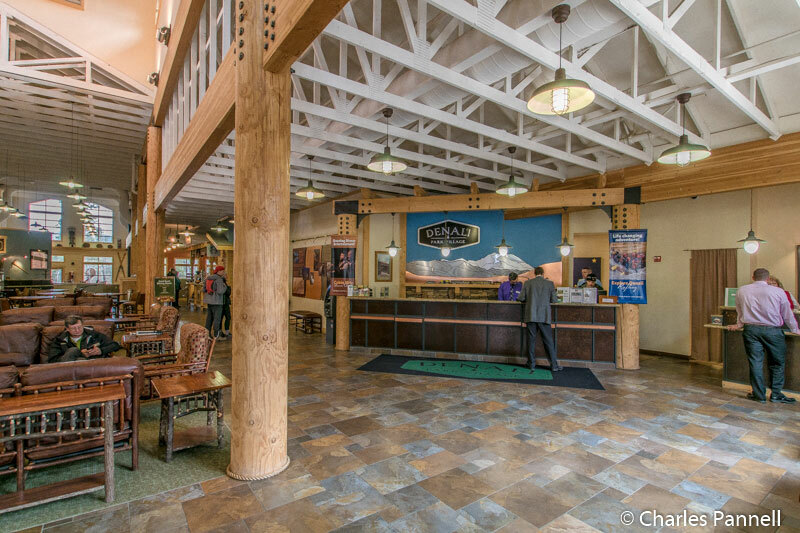 There’s ramped access up to the front office at the Denali Grizzly Bear Resort, and barrier-free access over to the front desk. Opened as a campground by Jack and Ede Reisland in 1968, today the property has grown to an impressive 92 hotel rooms and 33 cabins. It’s managed by Scott Reisland and even though the resort has grown, there’s still an emphasis on friendly and individualized service there. Room D1, which is located a short drive uphill from the main office, is a good choice for some wheelers and slow walkers. Accessible parking is available in a nearby dirt lot, and there’s a level drop-off area near the ramp up to the building. 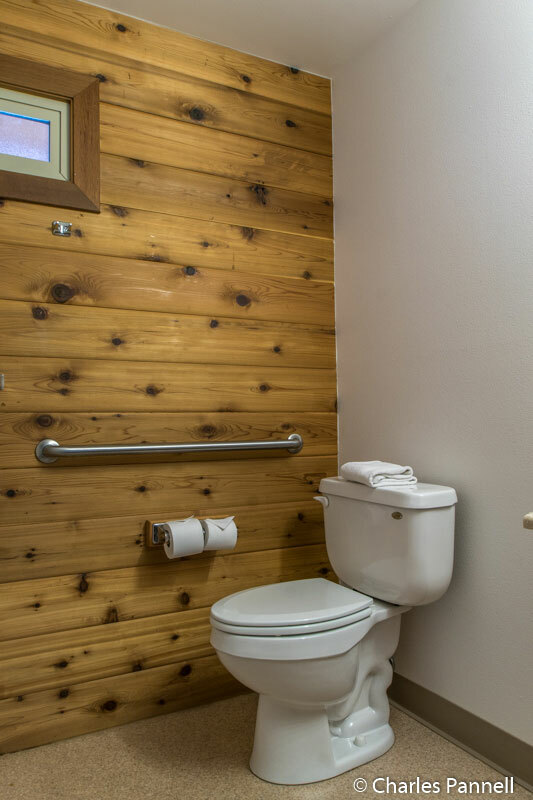 The room, which is accented with distinctive Alaskan touches, has wide doorways and plenty of room to maneuver a wheelchair. It’s furnished with a 25-inch high queen-sized bed with wheelchair access on both sides, a chest of drawers and an easy chair. 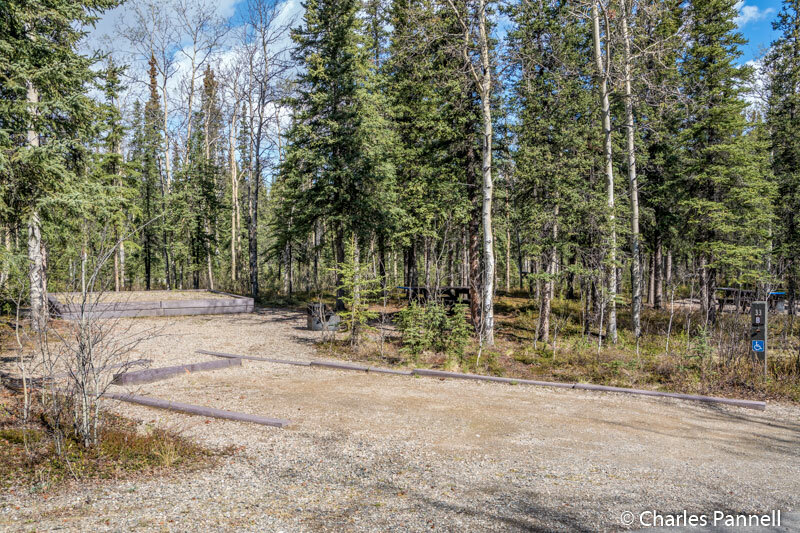 There’s a slight lip out to the private deck, which offers a spectacular view of the Nenana River as it skirts the property. 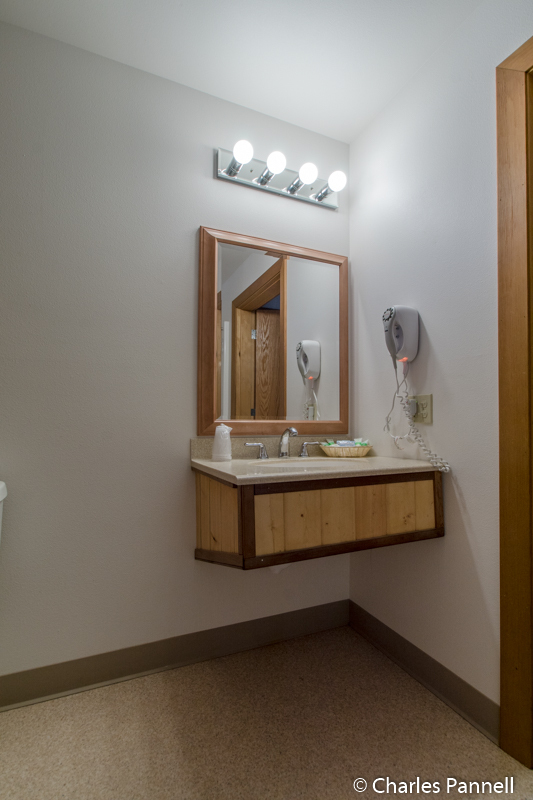 The bathroom has a full five-foot turning radius, and is outfitted with a tub/shower combination with grab bars, a hand-held showerhead and a fold-down slatted shower bench at the far end. Other access features include a roll-under sink and toilet grab bars on the back and right walls (as seated). Room B4 offers a higher level of access, and is located closer to the front office. Parking is available in a level dirt area across from the room, and there’s ramp access up to the front door. The cavernous room includes wide doorways and room enough for even the largest wheelchair or scooter to wheel around with ease. Furnishings include two 24-inch high double beds with an access aisle between them, a chest of drawers and an easy chair. This room also features that same killer river view from the private deck. The bathroom has a full five-foot turning radius and includes a roll-in shower with a padded fold-down shower bench, a hand-held showerhead and grab bars. Add in a roll-under sink and toilet grab bars on the left and back walls (as seated), and you have a very accessible room. Again, the emphasis is on personal service at the Denali Grizzly Bear Resort. A portable shower chair is available for any room upon request, and there’s also a loaner wheelchair in the office. And if you’d like a few suggestions about things to do in the area, don’t be afraid to hit up Scott. Not only is he a life-long local resident, but as a wheelchair-user he also has first-hand knowledge of the accessibility of businesses and attractions in his neck of the woods. Finally, if you’d prefer to camp out and enjoy the great outdoors, then the Riley Creek Campground, which is located near the park entrance, is the perfect choice. Although the campground is open year-round, the restrooms and showers are only open in the summer, so realistically it’s only a seasonal option. That said, it’s a beautiful — and very quiet — campground, which features a number of accessible campsites with raised tent platforms, accessible picnic tables and grills. Some campsites can also accommodate a RV. Reservations can be made at www.reservedenali.com; and as an added bonus, folks with an Access Pass or a Senior Pass get 50% off of all camping fees. Riley Creek Campground is located next to the Mercantile, which offers level access and carries a good variety of groceries, sundries and camping supplies. But by far one of the best features of the campground — the heated shower house— is located next to the Mercantile. There’s level access to both the men’s and the women’s side of the shower house. 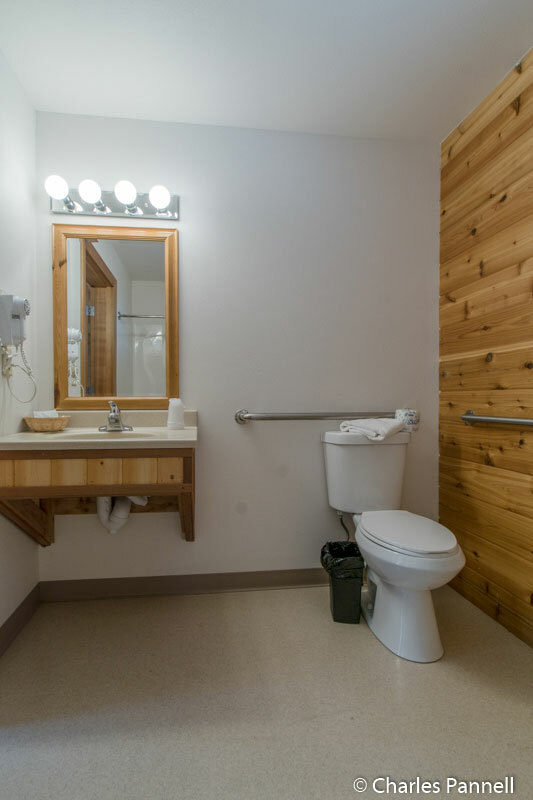 Both sides are outfitted with a large accessible toilet stall with grab bars, and a larger shower with a fold-down bench. 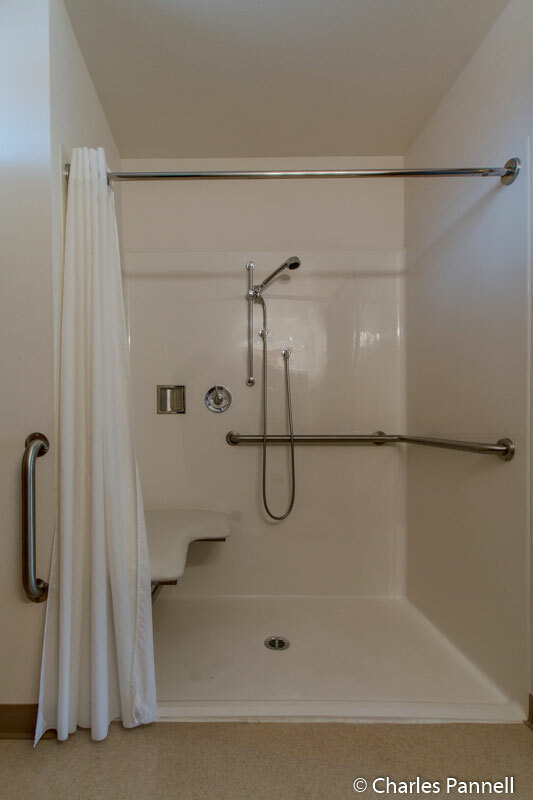 Although there is a one-inch lip on the accessible shower, most folks will be able to transfer directly to the fold-down shower bench. Riley Creek Campground is also located between two shuttle bus stops, so you can park your car for the duration of your stay. All of the park shuttle buses are wheelchair-accessible, and they stop at the popular sights and businesses near the park entrance. Remember to reserve your campsite early though, as Riley Creek Campground is a popular choice for many park visitors. 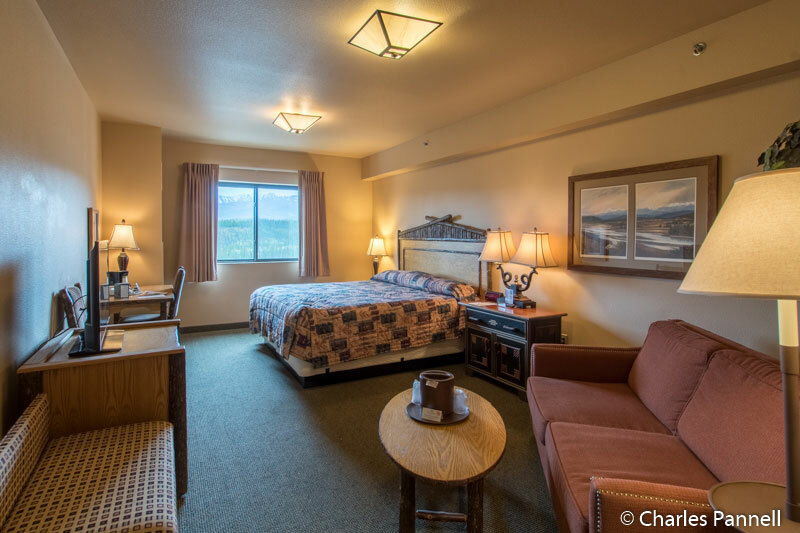 In the end, no matter what lodging option you choose, make plans to stay at least two or three nights in or near Denali National Park. Then, add an extra day for good measure, as you never know what Mom Nature will throw your way weather-wise in this neck of the woods! 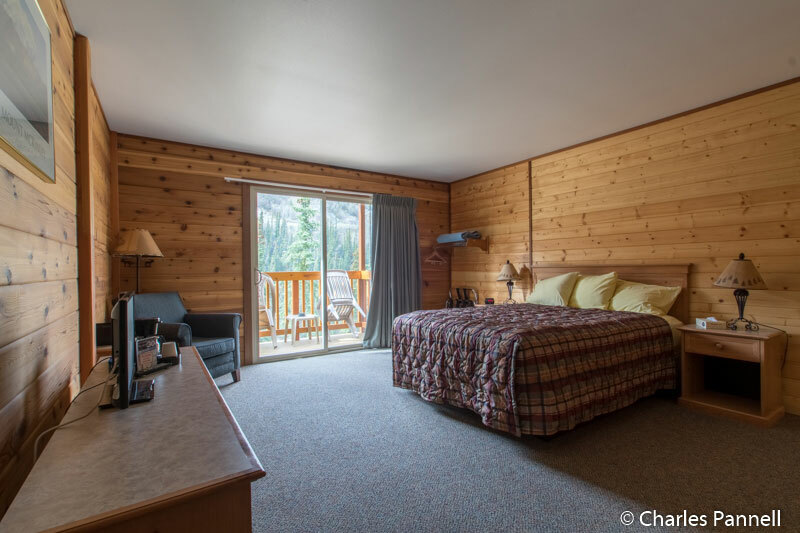 Either way, you won’t be disappointed with any of these accessible Denali lodging picks.